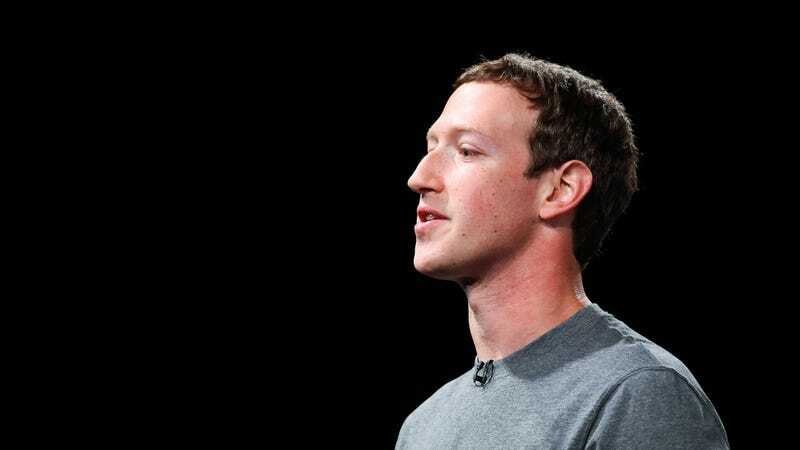 Facebook founder and NASCAR enthusiast Mark Zuckerberg likes a lot of things. He likes Facebook. He likes being in charge of Facebook. He even likes talking about how much he likes being in charge of Facebook. Mark Zuckerberg does not, however, like it when reporters publish embarrassing but true details about how he runs his Facebook page. Zuckerberg revealed as much in a recent interview with Sarah Frier and Max Chafkin of Bloomberg Businessweek. The interview broadly covers Zuck’s political ambitions—or lack thereof—while repeatedly reminding the reader that Facebook is in hot water for possibly enabling Russia to manipulate the 2016 presidential election, helping Trump supporters spread fake news, and offering racists the opportunity to target ads to users with interests like “Jew hater” or “How to burn Jews.” If you’ve been following Facebook’s inexcusable blunders over the past year or so, none of this is news to you. But Zuckerberg has his own concerns. As he says this, his publicist stands up and indicates the interview is over, but Zuckerberg isn’t quite done. He smiles and then says, “I need to give you a hard time.” He proceeds to complain about a Bloomberg Businessweek story in January that noted he employs a team of about a dozen content moderators—as well as communications managers, professional photographers, video producers, Morgan Freeman—who are all responsible for maintaining his personal Facebook page. “You’re taking away from all the time that I spent on this,” he says. There is a difference between truth and accuracy. But is the fifth richest person in the world really whining that the public thinks he doesn’t write his own Facebook posts? Does everyone think Zuck has a team of aspiring novelists that assembles the sometimes ill-advised public statements on Facebook’s role in the election? Did anyone really believe that Mark recruited a Ph.D. in sociology to draft that nonsensical 6,000-word open letter on “Building Global Community” back in February? No. Nobody’s publicly shaming Zuckerberg for having a staff, but damn, the boy genius sure does seem self-conscious about it! It’s not uncommon for public figures to scold journalists for reporting the truth. But staying mad for nine whole months over details concerning how you post online is weirdly hilarious. Rather than deny the facts, Zuckerberg actually doubles down on the idea that he needs help running his Facebook page, and despite his reputation as an often robotic megalomaniac, his Facebook posts are very “authentic” and, yes, he does do some of them all by himself, thank you very much! Facts aren’t always flattering, especially for Mark Zuckerberg. The Silicon Valley billionaire is having a hard year at work. Even Congress wants to take action after Russian trolls bought a bunch ads on Facebook during the 2016 election. Maybe Zuckerberg does hope to have a future in politics, and maybe that’s why he’s currently embroiled in a lawsuit with Facebook shareholders, who got upset when Zuckerberg tried to create a new class of shares that would still let him control the company even if he left. It’s possible that Mark is also sleep-deprived, since he just had his second daughter. Mark Zuckerberg’s reality is challenging right now. He has a lot of problems. But people knowing that he has a small army of handlers that help him run his Facebook page? That’s not one of them.